Okay, Leafs fans. It’s October of 1935. The new season still doesn’t start for another ten days, but your team wants you to renew your tickets. The Good News: They’re a powerhouse, who reach the Finals nearly every season. The Bad News: They never seem to win it … and it’s the depths of the Great Depression! So hard to comprehend those prices — but I guess we should remember that a good ticket was the equivalent of a couple hours of work/pay…..sort of like now. 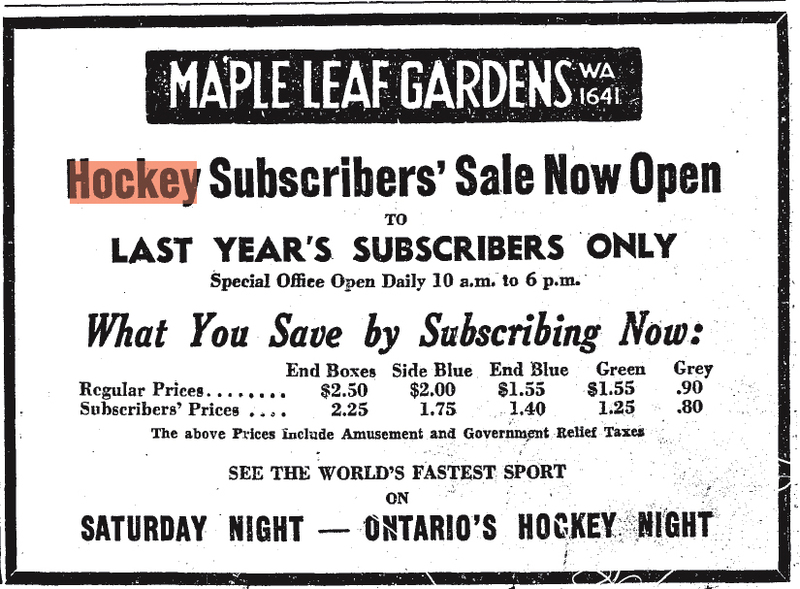 A similar ad I came across for upcoming games at the Gardens in January of 1936 … just a few months later … refers to Saturday Night as “Canada’s Hockey Night.” The earliest references to Foster Hewitt’s broadcasts as “Hockey Night in Canada” that I’ve seen come in stories about the new broadcast season starting up in November of 1937. Those prices seem so cheap compared to today but we know wages back then were nothign like they are now….so it is all relative I think….. Thanks for a good article….